THE annual crop loss due to pests in India was estimated at Rs 60,000 million in 1983, which at today’s prices could exceed Rs 2,00,000 million. The loss due to just one species, Helicoverpa armigera (Heliothis armigera), which attacks a number of important crops like cotton, tomato, brinjal, chick-pea, cabbage, cauliflower, okra and even fruits like strawberry and apple, is estimated to be over Rs 10,000 million per year. EVERY pesticide container carries certain information on its label. This information includes the trade name, technical name, composition, manufacturer’s address, registered uses, date of packing, date of expiry, and toxicity label, and is mandatory under the Insecticide Act, 1968. A renowned agriculture scientist has warned India’s food security will become unsustainable unless output is doubled to over 400 million tonnes in 10 years. PLANT parasitic nematodes are microscopic organisms, ubiquitous in nature, which cause severe damage to our crops. There is hardly any plant that is not attacked by them. Under heavy nematode infestation, there may be total crop failure. Crop rotation, clean cultivation, fallowing and summer ploughing are the traditional methods of nematode control. THE annual crop loss due to pests in India was estimated at Rs 60,000 million in 1983, which at today’s prices could exceed Rs 2,00,000 million. The loss due to just one species, Helicoverpa armigera (Heliothis armigera), which attacks a number of important crops like cotton, tomato, brinjal, chick-pea, cabbage, cauliflower, okra and even fruits like strawberry and apple, is estimated to be over Rs 10,000 million per year. The question is whether pesticides can be the answer to this menace. The answer cannot be in the affirmative. As pesticide consumption in India increased from 434 metric tones in 1954 to over 90,000 metric tones till 2001, resistance to pesticides is now known in over 504 insect and mite pests in comparison to only seven insect-pests in 1954. Among all insect pests, Helicoverpa is the most serious pest and is not affected much by pesticides. It wreaks havoc by turning into its victims’ defences. Now researchers at the University of Illinois, USA, have discovered the secret of the earworm’s (Helicoverpa zea) success. When the pest starts munching on a plant, it immediately activates the plant’s natural defences. First, signalling chemicals called jasmonate and salicylate are released inside the plant. 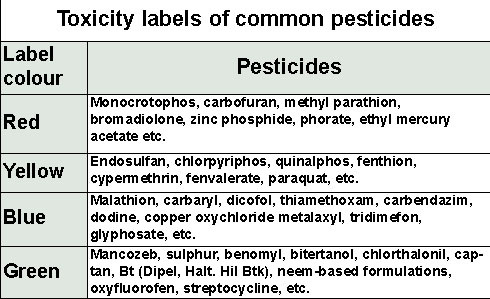 These chemicals then stimulate the production of toxins within the plant that should kill the pest when it eats them. However, researchers have found, the earworm can stay one step ahead of the plant’s defences. Jasmonate and salicylate, that are vital to triggering the plant’s defence, also switch on a set of genes inside the pest. These genes lead to the production of enzymes in this insect’s gut that break down the plant’s toxins as well as many synthetic pesticides into harmless by-products. The enzymes render the plant’s toxins useless before the plant has even had time to make them. This recent discovery of the earworm’s trick is the first evidence that insects can eavesdrop on plant’s defences. It could be bad news for commercial pesticide manufacturers who are keen to develop next-generation insecticides that work by mimicking salicylate and jasmonate. Widespread use of DDT (dichloro diphenyl trichloro ethane) to control mosquitoes, fruit flies and crop pests has also forced these insects to adapt to the wrath of the pesticide. A single genetic mutation protects fruit flies from the lethal effects of DDT and this genetic trait has spread around the world among fruit flies like wildfire. Surprisingly, every resistant fly had precisely the same genetic change, the addition of a "jumping gene", a short sequence of DNA (dioxy-ribose nucleic acid) that can insert itself into new locations in the genome. The researchers found this extra bit of DNA very near a gene coding for an enzyme that munches up harmful chemicals. The mutation somehow prompts this gene to create 100 times more of this enzyme than normal. The researchers could not find mutation in any fly strains collected in the 1930’s, prior to the use of DDT. It is very surprising that a single gene is responsible for all DDT resistance and the mutation has stuck around even in laboratory strains that never encountered DDT. This means that it could be very difficult to eliminate resistance to an insecticide even if you stopped using it. The discovery echoes similar research on the mosquito (Anopheles gambiae) that carries the malaria parasite. Scientists recently found that a DDT-resistance gene in mosquito had spread right up and down the West Coast of tropical Africa. Such rapid spread suggests that resistance to new insecticides is inevitable and impossible to stop, particularly for insects that travel around the world with people or food. Injudicious use of pesticides has resulted in a number of serious detrimental side effects. There are more and more reports of resistance to pesticides. The number of pest and disease outbreaks has increased (resurgence) and many innocuous insect species and pathogens have attained the status of serious pests/diseases in recent years. The contamination of soil, water and air is increasing to alarming proportions. Another point of concern is the detection of pesticide residues in almost all types of food materials. In 1962, Rachel Carson in her book Silent Spring aroused worldwide concern about the excessive use of pesticides which eventually led to the concept of integrated pest management as an environmentally sound alternative to the sole use of chemicals. Agenda 21 of the United Nations Conference on Environment and Development at Rio de Janeiro in June 1992 identified integrated pest management and control in agriculture as one of the requirements for promoting sustainable agriculture and rural development. An integrated strategy for crop pest and disease management includes modifying organic practices to evade and reduce pest/diseases incidence, biological control, soil solarisation and other novel approaches for pest and disease suppression and only need-based and judicious use of chemical pesticides. A toxicity label on a container conveys the toxicity hazard of the pesticide to mammals, mainly human beings, which is shown in a square—set at an angle of 45`B0—or a diamond, divided into two equal inverse triangles. The lower triangle is brightly coloured whereas the upper contains warning words and signals. The warning words are always written outside the upper triangle whereas the signal words can be given either inside or outside the triangle. There are four toxicity classes of pesticides, which are represented by bright red, yellow, blue and green colours in the lower triangle—their toxicity decreases in that order. A look at the colour of the lower triangle can give us an idea of its toxicity to humans. The hazard ratings, or the toxicity classes, are based on the acute toxicity represented by LD50 (median lethal dose) values. The LD50 value is nothing but "the dose of the pesticide (active ingredient) required to kill 50 per cent or the test population, generally rats, when orally treated," and is expressed as mg/kg of the body weight. Lesser the LD50 value more toxic the pesticide is and vice versa; e.g., a pesticide with a LD50 value of 10 will be more toxic than the pesticide having an LD50 value of 100—in other words, for a person weighing 60 kg a dose of 600 mg of active ingredient of the former category of pesticide will prove fatal, whereas in the latter case a dose of 6000 mg is required for the same. Except for Bt (Dipel, Halt, etc.) and plant-based formulations (neem formulations), no insecticide is provided with a green label, whereas many of the fungicides, bactericides and herbicides carry the green label and most of them are in the category of blue or green. Most of the pesticide-poisoning accidents result from carelessness or ignorance in handling chemicals. 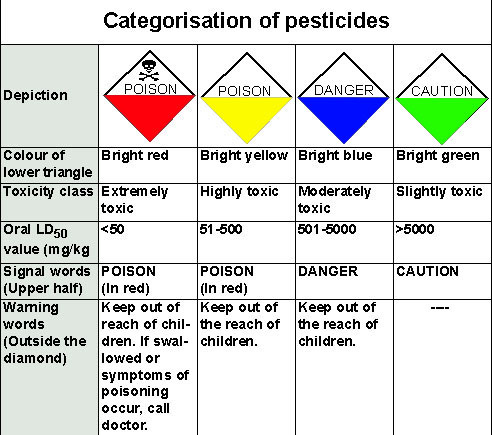 One should take utmost care while dealing with the red-labelled pesticides, followed by yellow and blue. Green-labelled pesticides are relatively safe, but that does not mean that we need not take any care while using them. This acceleration will have to come despite diminishing land resources, increasing biotic and abiotic stresses, natural shrinkage and degradation, climate change, rising input cost, loss of bio-diversity and burgeoning population, the scientist, R S Paroda, has said in his new publication. Against a projected requirement of 230 million tonne foodgrains, according to Paroda’s book Sustaining Our Food Security, the actual output this year is likely to be only 191 million tonnes. Paroda, a former Director-General of the Indian Council of Agricultural Research (ICAR), has made the projection keeping in view the rate of population, income, demand of food, fodder, seed, industrial and other uses. In a compilation of his lectures and papers, Paroda cautions that the targets will not be achievable unless major support is given to rainfed areas, particularly in East India and other unfavourable regions where technological, socio-economic and infrastructure bottlenecks exist. The 775-page tome has forewords by renowned agri-experts Norman E. Borlaug and M.S. Swaminathan and will be formally released by Agriculture Minister Ajit Singh in a few days. The book comprises seven parts and takes up a number of issues, including achievements and potential of rice production in Asia and sustainability and productivity of the rice-wheat system. The book tells us how the profitability of the rice-wheat system, as of rice and wheat separately, has been declining since the pattern was adopted in late 1960s and early 1970s. This, it says, is due to a long-term decline in ‘real’ rice and wheat prices, decelerating yield growths and increasing input costs. The price fall in the past 20 years is mainly due to domestic production outpacing population growth, thus eliminating or lessening imports. However, in wheat, due to low global prices and rapid industrialisation, several Asia-Pacific countries find it more cost-effective to import rather than produce. The problem of rice availability in the Asia-Pacific region would appear to have been solved, but there is no room for complacency, it warns. One of the seven parts of the book deals with conserving genetic resources with three write-ups, including one titled "Is Global Conflict on Plant Genetic Resources Justified?" Genetic resources collection and conservation activities have intensified since the establishment of the International Board for Plant Genetic Resources in 1974. The conflict is between haves and have-nots, since most of the genetic resources come from the developing world but were conserved mainly in the gene banks of the developed nations, leading to heated debates and arguments world wide. The Global Biodiversity Convention stipulates exchange of genetic material to be regulated among countries on mutually agreed terms. Hence, what is needed now is to develop appropriate guidelines for this purpose rather than to have a North-South divide on the subject. There is also a conflict of rights. While plant breeding in developing countries has remained largely in the public sector, a major role is played by the private sector in the industrialised countries. For their survival and growth, private companies have to protect their rights on varieties so developed in the form of different systems of intellectual property rights (IPR). Paroda feels a sui generis system of varietal protection should be generated that ensures recognition and reward for the informal innovations in the form of "farmers’ rights," including ones to keep and plant their own seeds. Being a compilation of lectures already given and papers already presented, the work may seem to be a ‘copy and paste’ job. Nevertheless, it has a wealth of information on policy reforms, food security, natural resource management and importance of national and international partnership in agricultural research. At a time when India needs to accelerate production from five to 10 million tonnes per year, productivity is still quite low, the book points out. "But how does one increase it? By using more water, nutrients and pesticides, or by considering other alternatives?" It is in this direction that there is a tremendous potential by way of new products and processes offered by biotechnology, a tool to supplement one’s efforts. While working on transgenic crops, traits of interest from the Indian point of view are herbicide tolerance and insect resistance. The loss on account of weeds is between 15 and 30 per cent. The problem by and large is overcome by manual weeding, yet insect-pest damage in cotton crops is high and the crop needs 50 per cent of the entire nation’s pesticide application. "By transferring Bt genes into plants, we can virtually build an insecticide factory inside the plant," it says. PLANT parasitic nematodes are microscopic organisms, ubiquitous in nature, which cause severe damage to our crops. There is hardly any plant that is not attacked by them. Under heavy nematode infestation, there may be total crop failure. Crop rotation, clean cultivation, fallowing and summer ploughing are the traditional methods of nematode control. Use of nematicides for nematode control is very rare due to their prohibitive costs, environmental pollution, adverse effects on non-target organisms and residue problems in food and feed. Research on the use of botanical and microbial pesticides is being encouraged. Some fungi and bacteria have been found acting as parasites on nematodes. But none could be exploited to control nematodes under field conditions. A few years ago, a bacterial parasite (Pasteuria penetrans) of nematodes was discovered. This nematode-parasitic bacterium is highly specific to its host and its life cycle is synchronised with that nematode. The bacterial spores are non-motile. When a nematode wandering in soil comes in contact with these spores they get attached to its body cuticle. Not all kinds of nematodes are attacked by a single type of bacterium. The bacterium-nematode relationship has been well studied in root-knot, a polyphagous nematode. When the nematode larvae enter the root and start feeding the spore terminates and pierces the nematode cuticle, and the spore material (DNA strands and cytoplasmic mass) is passed into the nematode body fluid. The spore gives rise to a ball-shaped mycelial colony which fragments into daughter colonies to fill the entire nematode body fluid. The nematode grows normally to reach adulthood, by which time the bacterium multiplies inside to produce millions of spores again. The nematode reproductive system becomes defunct and is rendered infertile. Consequently there is no egg production. The spores from the nematode carcass are released in soil upon root decay and again infect the nematodes wandering in soil. Spores of the bacterium are host specific and can survive in soil for several years, withstanding even adverse conditions. This bacterium can be used as a potential bio-control agent of plant parasitic nematodes, especially the root-knot nematodes. Preliminary studies have shown encouraging results. Current methods of multiplying the bacterium under in vivo conditions for small-scale application already exist. Efforts are being made to culture it on synthetic media under laboratory conditions. Once its mass multiplication technique is developed, it would be very useful for large-scale management of nematodes in field horticultural crops.